﻿﻿S﻿ynopsis : ﻿There is nothing hidden that will not be revealed ...On an autumn day in 1686, eighteen-year-old Nella Oortman knocks at the door of a grand house in the wealthiest quarter of Amsterdam. She has come from the country to begin a new life as the wife of illustrious merchant trader Johannes Brandt, but instead she is met by his sharp-tongued sister, Marin. Only later does Johannes appear and present her with an extraordinary wedding gift: a cabinet-sized replica of their home. It is to be furnished by an elusive miniaturist, whose tiny creations mirror their real-life counterparts in unexpected ways ...Nella is at first mystified by the closed world of the Brandt household, but as she uncovers its secrets she realizes the escalating dangers that await them all. 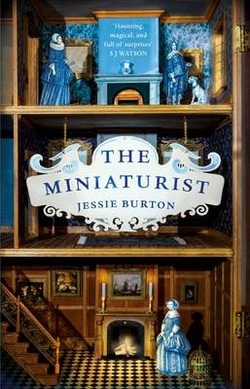 Does the miniaturist hold their fate in her hands? And will she be the key to their salvation or the architect of their downfall? Beautiful, intoxicating and filled with heart-pounding suspense, The Miniaturist is a magnificent story of love and obsession, betrayal and retribution, appearance and truth.